The four star Meadowlands Hotel is a family run Gaeltacht hotel located just a mile from the centre of Tralee and on the Wild Atlantic Way. The Meadowlands Hotel is the perfect base for to explore Kerry and its stunning championship and links golf courses. Arnold Palmer’s magnificent course at Tralee is bound to take it out of you, so the relaxing Meadowlands is the perfect place to recuperate. The golf around Tralee may be the main attraction, but the excellent Meadowlands Hotel ensures that your golf tour in the south west will be enjoyed in the utmost comfort. Guestrooms are carefully designed to ensure a restful night’s sleep in complete luxury with a sense of style and individuality. An Móinéar Restaurant offers a warm and tranquil atmosphere with a secluded balcony for intimate dining and dinner parties. The restaurant features an outstanding menu inspired from Irish & International specialities and served in an elegant and cozy atmosphere. Menus are prepared to reflect Kerry’s best locally produced ingredients with the fish and seafood sourced from the family’s own fish company in the village of Dingle on a daily basis. 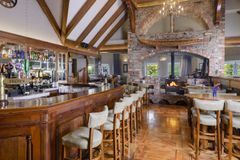 Johnny Frank’s Bar is a spacious locale which has a stunning interior that mixes the best of tradition and contemporary design to give a warm and inviting ambience. With comfort and style combined, you can relax and unwind, enjoying a choice of delicious coffees and teas, cocktails and various drinks and snacks. Superb bar food menus are offered for casual dining. The snug, fireplace, balcony, library and comfortable seating along with many music sessions ensure Caint, Ceol agus Craic!